3/22/2019 (Elizabethtown, N.C.) – East Bladen High School in Elizabethtown was awarded a smoothie grant through The Dairy Alliance. The school used the grant money to purchases an immersion blender to make dairy smoothies in large portions. 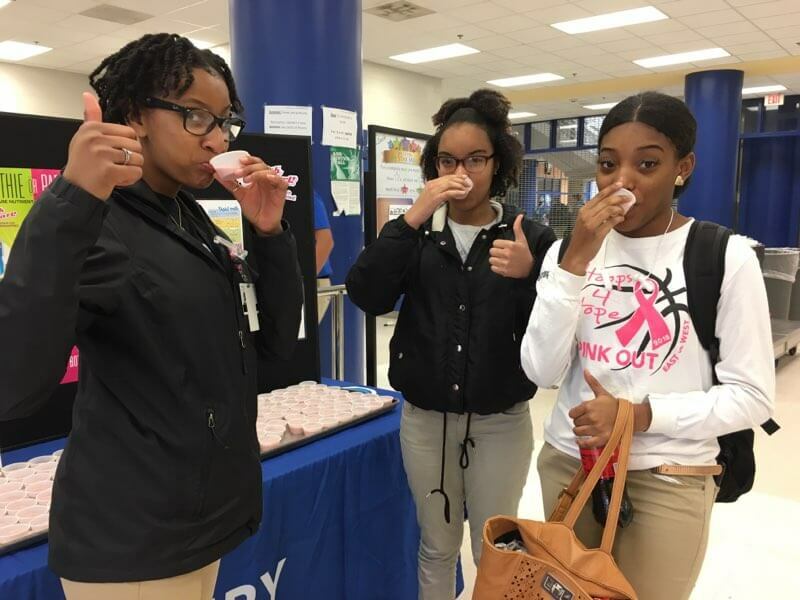 The Dairy Alliance visited East Bladen High and hosted a smoothie tasting to get the students excited about the future smoothie additions to the breakfast menu. Over 600 students and teachers sampled the different flavors of smoothies! The school nutrition staff learned how to operate the blender and practiced a variety of recipes. Students were excited to have the smoothies added to their daily breakfast menu! 3/6/2019 (Mooresville, N.C.) – Local racing celebrity, Max Papis, joined The Dairy Alliance and the Fuel Up to Play 60 team at Lake Norman Elementary School in Mooresville to kick off National School Breakfast Week. Papis encouraged students to fuel their mornings with school breakfast and milk! Lake Norman Elementary recently received a Fuel Up To Play 60 grant to purchase a Grab N Go Kiosk. The Grab N Go program allows students to eat breakfast in the classroom. The new program will serve over 600 students each day! 2/26/2019 (Harmony, N.C.) – Union Grove Elementary School in Iredell County is one of several schools in the district that provide an alternative breakfast program to ensure that all students have the opportunity to start their day with a healthy school breakfast. While their breakfast in the classroom is successful, there was some concern over the milk that is left over. Therefore, The Dairy Alliance teamed up with the School Nutrition Program to provide dairy education and a chocolate milk taste test for the students. Since the National School Lunch Program’s guidelines have changed and will now allow schools to offer 1% flavored milk, the district wanted to see if students had a preference. The results from this taste test suggest that more students would likely consume chocolate milk if they switched to 1% chocolate milk. 75% of the students who participated in the tasting preferred the 1% chocolate milk over fat-free chocolate milk. Iredell County is looking into making the switch to 1% chocolate milk to increase milk consumption among its students. 2/20/2019 (Greenville, Sc) – The Southeast American College of Sports Medicine meeting held in Greenville, South Carolina brought together over 1200 professionals and students that work and study in the field of sports medicine and exercise science. The Dairy Alliance sponsored this year’s guest speaker Marie Spano, MS, RD, CSSD, who presented on “From Young Athletes to the Elderly; Protein Needs throughout the Lifespan.” Spano reviewed the benefits of animal protein versus plant protein and explained why dairy is an essential part of an athlete’s diet. She also spoke to students at a mentoring breakfast discussing her career path and providing tips to the students for finding theirs. Additionally, The Dairy Alliance staff exhibited during the meeting with material on dairy versus alternatives, whey protein, lactose intolerance and dairy for athletes. Attendees took home dairy education material and dairy promotional items. 2/1/2019 (Rowan County, N.C.) –Three high schools in Rowan County received smoothie equipment grants from The Dairy Alliance to help students receive the essential nutrients in dairy. Each of the schools serve smoothies at breakfast, lunch and supper meals. Each smoothie contains two cups of dairy! These smoothies have been a great success and the students are continuously coming up with new creative flavors. As a result of the smoothie program, the three schools moved 116,355 pounds of dairy in one year! 1/28/2019 (Raleigh, N.C.) – The Dairy Alliance teamed up with Cracker Barrel to feature a limited-time ice cream for the holiday season. Cracker Barrel featured the salted caramel ice cream at all 653 locations nationwide from November 1 to December 24, 2018. During that time, 12,000 gallons of salted caramel ice cream were sold which equates to 17,280 pounds of milk in just under two months! 12/3/2018 (Greenville, N.C.) – “Strength In Numbers” is the theme of the 2018 North Carolina Department of Public Instruction and No Kid Hungry SummerPalooza Summits. Throughout October and November, The Dairy Alliance partnered with NKH and NCDPI at four events across the state. 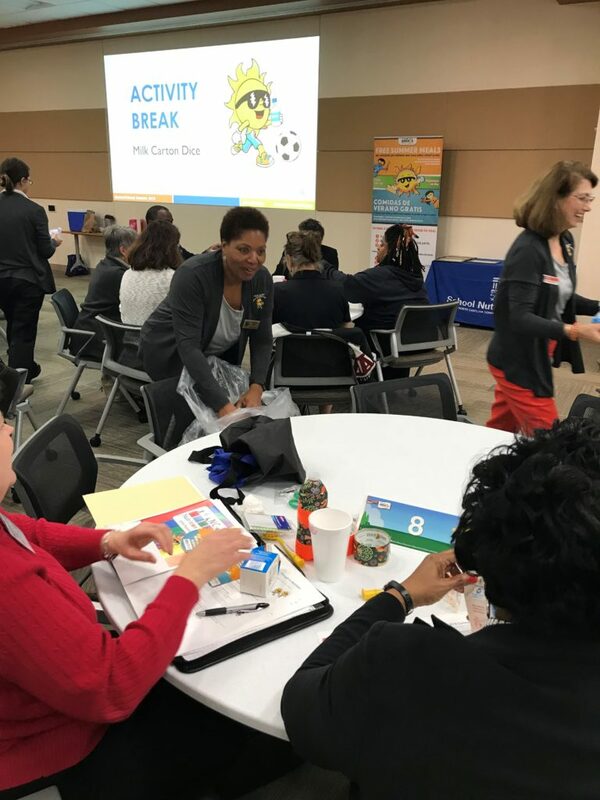 Participants included schools and other organizations who are interested in exploring new partnerships, building sustainable summer meals programs and connecting with other leaders in North Carolina Summer Nutrition. The Dairy Alliance provided several resources for summer meals, including nutrition education materials, marketing and promotion materials and equipment grant opportunities. The Dairy Alliance staff presented at these events to raise awareness of the essential nutrients in milk and dairy foods and provide helpful recommendations aimed to increase dairy consumption. “We know that children aren’t drinking enough milk. In an effort to help increase consumption, we came up with the milk carton dice activity to not only increase milk consumption but to support our strength in numbers theme. The Milk represents “strength” and the dots on the dice represents “numbers,” said Jessica Soldavini, Graduate Research Assistant with NKH. The Dairy Alliance provided the Milk Carton Dice instructions to attendees to use at their summer meals sites. This activity encourages children to get their three daily servings of dairy. 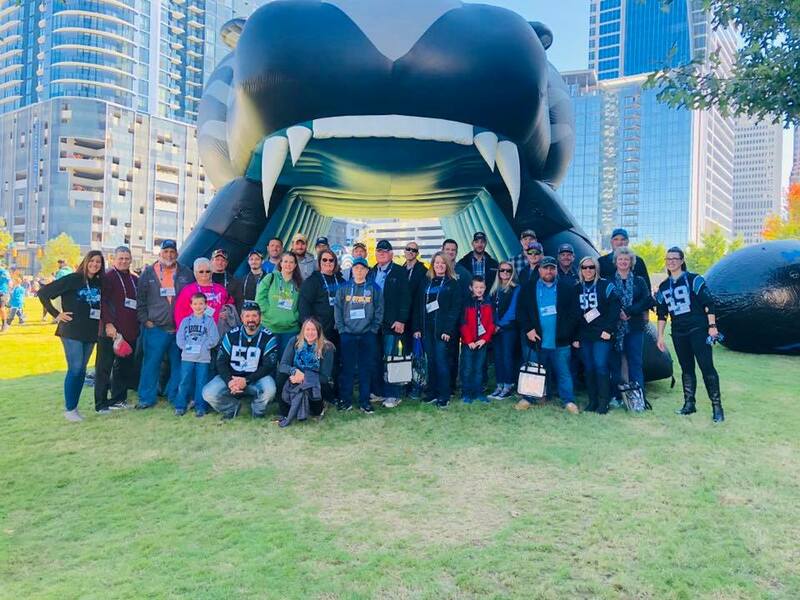 11/4/2018 (Charlotte, N.C.) – Dairy families from both Carolinas and Virginia made their way to Bank of America stadium to be our honored guests at the 2018 Dairy Appreciation Carolina Panthers game. Virginia’s Fuel Up To Play 60 Student Ambassador, Nicholas Liberatore, led pre-game physical activity and nutrition challenges at the farmer sponsored Fuel Up To Play 60 Combine in Bearden Park. PET Dairy was on hand with free TruMoo milk for park goers. As farm families enjoyed a tailgate luncheon they heard from Charlotte-Mecklenburg Schools sports registered dietitians, trained as dairy advocates in 2018. Our new advocates expressed their appreciation for our farm families and how valuable the dairy trainings have been when promoting healthy nutrition to 10,000 student-athletes that call Charlotte-Mecklenburg Schools home. 10/15/2018 (Raleigh, N.C.) – Donna Martin, Registered Dietitian and dairy advocate, appeared on Coffee with America to support The Dairy Alliance’s Eat Together, Eat Better campaign. Donna talked about the three tips to help families eat together: plan, prep and pack the pantry. She also discussed the health benefits children receive from eating with their families. Her video has over 2.5 million views so far! Watch the full segment here. 10/9/2018 (Charlotte, N.C.) – On behalf of the National Football League and dairy farm families of North Carolina, the Carolina Panthers and The Dairy Alliance presented Charlotte-Mecklenburg Schools with a $10,000 Hometown Grant. The Hometown Grant will assist Charlotte-Mecklenburg schools in making improvements to in-school nutrition and physical activities. 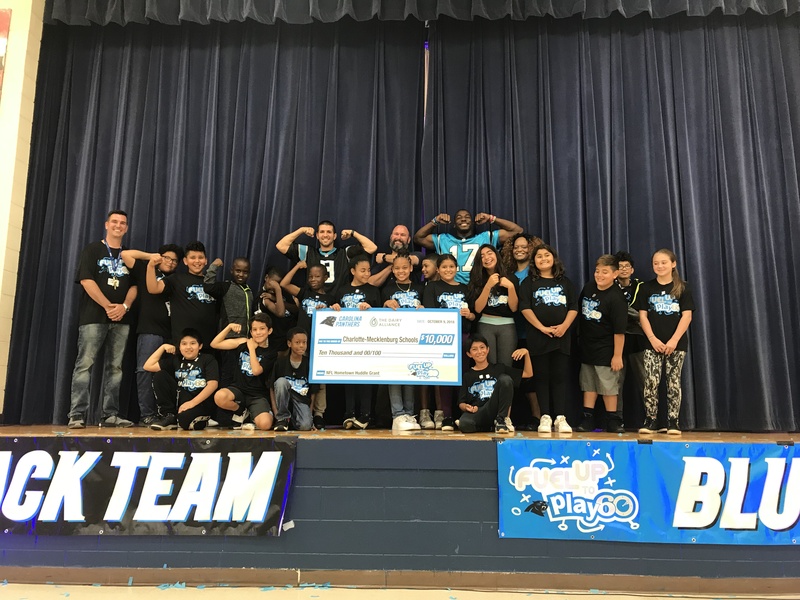 Robin Lyles, Assistant Principal for Lebanon Road Elementary said, “We’re very grateful for the resources from Fuel Up to Play 60 to make healthier eating and the right amount of activity a reality for our students.” In spring of 2018, Fuel Up to Play 60 students led Panthers player, Graham Gano and North Carolina dairy farmer, Roddy Purser, on a tour of their school garden and shared a school lunch with the pair. Prior to the garden tour, Fuel Up to Play 60 students and Gano visited Purser’s dairy farm in Peachland, North Carolina to learn what it takes to produce milk. Since the program began in 2009, the dairy farm families in the Carolinas have invested over $1 million dollars to support Fuel Up to Play 60 in their schools. “This is a special relationship we have with the students through Fuel Up to Play 60. They are doing great work at Lebanon Road Elementary to get kids proper nutrition and physical activity” said Roddy Purser. “We’re proud to do our part providing milk to drink and encouraging kids to make healthy choices for their life” added Purser.